Conches are ubiquitous across the Caribbean. The decorative shells are exported and made into jewelry, and the huge gastropod inside is a staple food. But new research suggests that the conch is possibly being loved to death. You might say that those who have believed that flamingos are natives of Florida are tinkled pink at new reported findings. 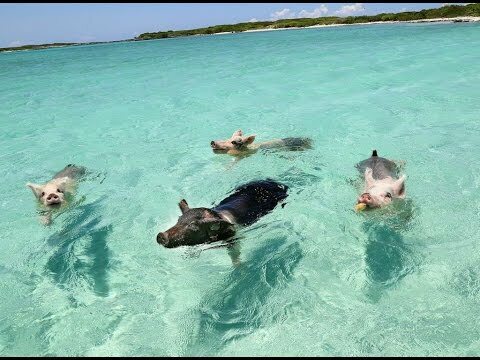 In the Bahamas, there are beaches where you can swim with pigs. And lots of selfie-happy tourists did — until recently. It's not just local black residents who fear police interactions in the US. Now citizens from Caribbean countries like the Bahamas see reasons to be extra cautious while traveling in the US. The public television smash hit Downton Abbey is making waves again — though not because its killed off another character. It's because of one of the show's dogs. Specifically Isis. And you can probably figure out where this is going. Meanwhile, in Finland, the country's prime minister is blaming Apple for its economic problems. And France is blaming the English-speaking the world for being too politically correct. Those stories and more in today's Global Scan. The US is reining in internal eavesdropping, but what about spying on the rest of the world? Americans are focused on spying by the NSA inside the US. But a former cyber-security advisor says the bigger debate over spying on foreigners has hardly started. Alina Simone went to Harlem's Apollo Theater to witness the Amateur Night competition and found that all the top winners share something in common. They all came from outside the US. A new book claims that Britain has invaded more countries than any other. Anchor Aaron Schachter discusses the claim with the World's News Editor and resident history buff, Chris Woolf. Our Geo Quiz sends us in search of the largest city in the Bahamas. The annual Junkanoo Festival takes place across the islands, but the main revelry occurs in this city's downtown. Scott Gurian sent us this audio postcard. For the Geo Quiz, we want you to name the westernmost district of the Bahamas where Martin Luther King Jr. visited in 1964 and 1968. An American chemist says he's found a substance several, in fact, that can repel some of the most fearsome predators in the ocean, and he wants to use his discovery to protect them. Reporter Ari Daniel Shapiro of our partner program NOVA has the story. During the American Revolution, many colonists, had good reason for not breaking with the crown.